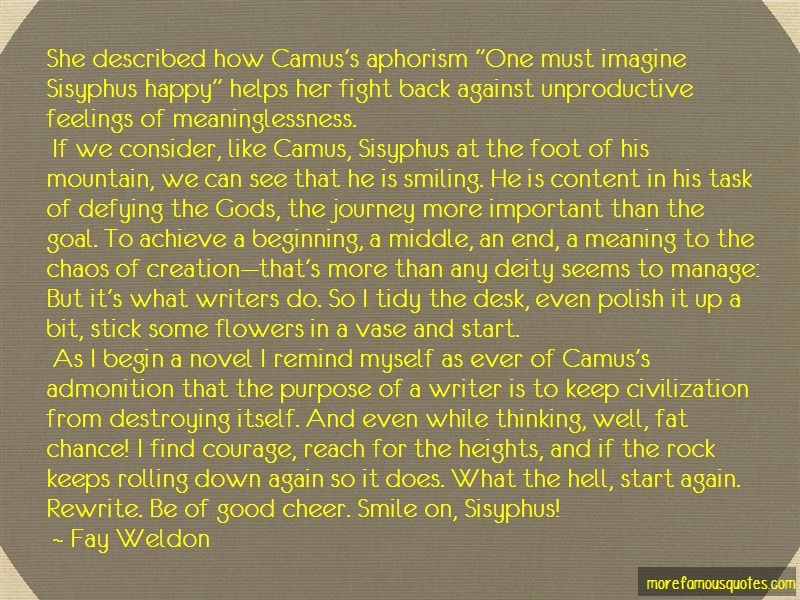 “She Described How Camus's Aphorism "One Must Imagine Sisyphus Happy" Helps Her Fight Back Against Unproductive Feelings Of Meaninglessness. If We Consider, Like Camus, Sisyphus At The Foot Of His Mountain, We Can See That He Is Smiling. He Is Content In His Task Of Defying The Gods, The Journey More Important Than The Goal. To Achieve A Beginning, A Middle, An End, A Meaning To The Chaos Of Creation-that's More Than Any Deity Seems To Manage: But It's What Writers Do. So I Tidy The Desk, Even Polish It Up A Bit, Stick Some Flowers In A Vase And Start.